What can those with visibility and influence do—beyond stating support for a particular movement—to combat injustice? Can those with power and privilege advance the interests of others without hijacking or getting in the way of the efforts of the marginalized groups they mean to support? For example, when actor and investor Ashton Kutcher announced his intention to co-host a live discussion about gender equality in the workplace on his Facebook page this summer, the social media backlash was swift and fierce. 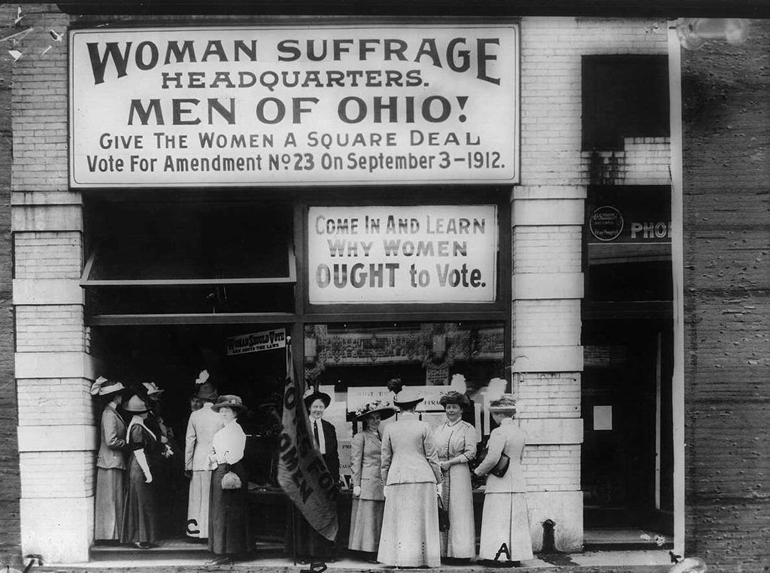 A new book documents how a group of powerful men offered themselves as foot soldiers in the fight for women’s suffrage a century ago. The Suffragents: How Women Used Men to Get the Vote (SUNY Press, 2017) by New York University journalism professor Brooke Kroeger reads almost as a manual for how people might sensitively approach allyship today. The Men’s League got its unlikely start when the Reverend Doctor Anna Howard Shaw, president of the National American Woman Suffrage Association, invited Oswald Garrison Villard, publisher of The Nation and The New York Evening Post, to a suffrage convention in Buffalo in October 1908. Villard insisted that he was too busy to “prepare an elaborate address” for the event but proposed another idea: What if he were to assemble a group of at least one hundred influential men—progressive reformers, public intellectuals, and wealthy industrialists whose names would “impress the public and the legislators”— to lend public support of the cause? By 1911, League membership had grown to 150, with George Foster Peabody, John Dewey, Rabbi Stephen S. Wise, and George Creel among the notable men to sign on to the project. In May of that year, 89 Men’s Leaguers, many of them husbands, brothers, or sons of women involved in the movement, joined the second annual Women’s Suffrage Day Parade down 5th Avenue, where they were met with jeers— “hold up your skirts, girls!”—from the crowd of 10,000 spectators. The strategy worked, with league chapters soon fanning out from New York across the country. 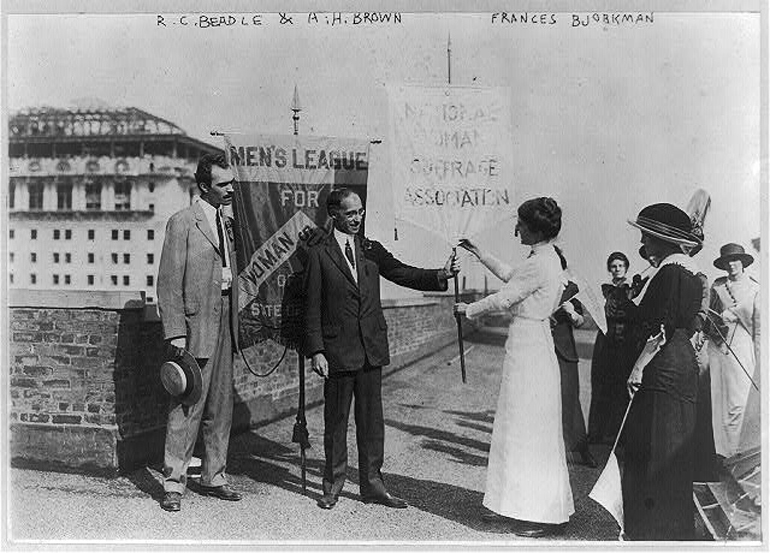 And the growing membership did more than brave hecklers in parades: Taking direction from Shaw, Carrie Chapman Catt, and other NAWSA leaders, men used their connections and political clout to advance the suffragist cause in spheres women couldn’t otherwise have reached. They argued in favor of women’s suffrage in prestigious publications, sometimes devoting entire issues to the cause; lobbied political operatives to get it into party platforms and served on committees to get suffrage bills before legislatures; pounded the pavement and raised campaign funds in advance of votes on suffrage amendments; and in at least one case even agreed to perform in a suffrage-themed vaudeville routine. By articulating the case for suffrage in terms that would appeal to their particular audiences, the men helped replace older, sentimental arguments about women’s moral purity with stronger logic about democratic justice. But she also suggests that members of the Men’s League, which included close friends, confidants, and supporters of Woodrow Wilson, may also have also played a pivotal role in shaping the president’s thinking on the issue at the federal level in the tense run-up to the ratification of the 19th Amendment in 1920. It’s impossible to know what finally pushed Wilson to endorse the idea in a 1918 speech to Congress—it could have been women’s contributions to World War I, or the militant suffragists picketing on his lawn—but Kroeger suggests that the Men’s Leaguers in his inner circle must have made an impression. George Creel, for example, became Wilson’s head of the US Committee on Public Information in 1917. And that same year, another Wilson appointee, Dudley Field Malone, resigned from his post in frustration over the administration’s stalling on the suffrage question. “I think it is high time that men in this generation, at some cost to themselves, stood up to battle for the national enfranchisement of women,” he wrote.